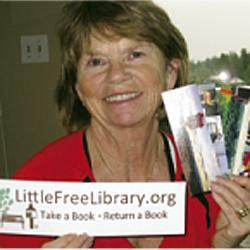 Bonnie Magnusson with Little Library promotional materials. Bonnie opens the door to her little world of great literature. Admission: Free! This handsome structure housed the main branch of the Tacoma Public Library from 1903 to 1952. If you haven't yet joined the Society, you're missing out on a quarterly newsletter that's always packed with interesting articles and photos (many in color) related to Lakewood's past and present. Articles like the one here are available in our online archives, but every once in a while we like to highlight a representative example to whet your interest. In this case, it also allows us to make a correction: Bonnie Magnusson, the gracious lady in the accompanying photos, was misidentified in the captions of our print issue. Most Lakewood residents know about the Lakewood Public Library on Wildaire Drive. It’s been there for more than half a century. But few are familiar with a trio of other area free libraries: one in Oakbrook, one in Lake City, and one just off Interlaaken Drive. The latter “opened” this past August. Motorists driving (or pedestrians walking) along Interlaaken Drive have to be very alert to spot the small library that stands atop a post at the intersection of 104th SW. This local book repository is “owned” by Bonnie and John Magnusson, and the mini-library’s “story” is a unique tale. Built earlier this past summer as a 40th anniversary gift, it is number 16,986 in the annals of the Little Library Organization. It cost $25 to register their library. The Magnusson’s library consists of a door and a tiny room in which to store the literary inventory: kids’ books, novels, cookbooks, etc. In keeping with the library’s scale, it’s located atop a slab of a downed fir tree (Lakewood’s library has a largeslab on display). Magnusson’s library features a door, a tin roof that’s large enough to hang over the door, and storage space, and it’s made from recycled materials. Creation of this personal library,said Bonnie, was inspired after learning about the Wisconsin-based Little Free Library project, founded in 2009 by Todd Bol. “The best part was making the house,” she continued. “It had to be water tight,” Bonnie added. “All seams were caulked.” Recent November rains have been a good test of that aspect. From the small Wisconsin community, the little free lending library concept has spread worldwide, Bonnie said, displaying bookmarkers that depict little libraries in Slovakia, India, Germany and the Netherlands. It’s been a big success, Sylvia says, adding that she plans to make more little free libraries—chalet-style and school-house style. According to the library’s website, Bol built a model of a one-room schoolhouse as a tribute to his mother, a former teacher who loved reading. The schoolhouse replica was filled with books, and included a sign reading “free books,” encouraging passersby to take a book, and either return the book or add another book. Thus far, the book-lending ritual is working. 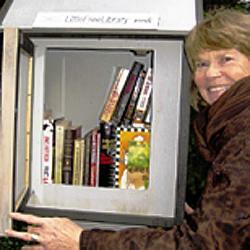 The website provides lots of tips for building little libraries. 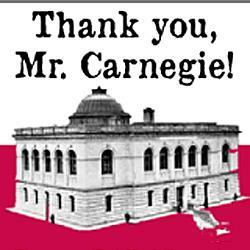 The idea was patterned on the Carnegie Free Library organization. Andrew Carnegie, a late 19th century philanthropist, (1883-1926), the “Bill Gates” of his era, began a free library system in his home town of Dunfermline, Scotland, and then his adopted home of Allegheny, PA. Eventually, there were 2,506 Carnegie Libraries around the U.S.
Tacoma’s public library on Tacoma Ave began as a Carnegie Library, and its Pacific Northwest Room is housed in the former Carnegie space. Eventually the research area took over the entire second floor. The new part of the library was added in 1952. The Northwest Room was officially created in 1973. The Carnegie Building was remodeled/restored in 1990.